Easy to grow with colorful flowers held atop pretty green foliage. 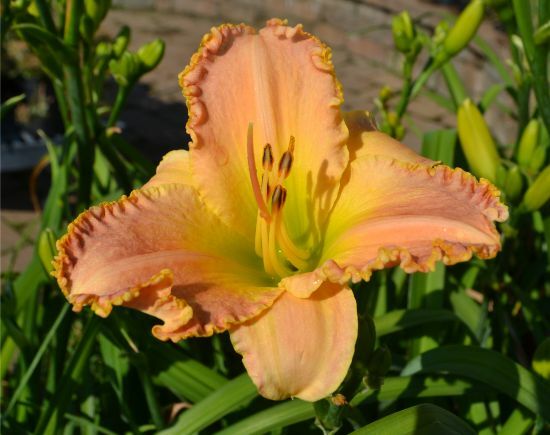 These beautiful blooms only last a day, hence the name “Day” lily. They provide a long season of colorful blossoms and attractive foliage, and ask little in return. Few perennials are as tough, long-lived, or pest-free. 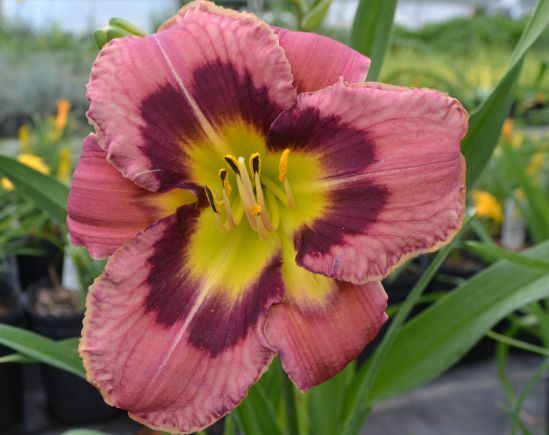 Daylilies do, however, benefit from being dug up and divided every few years, a process their natural toughness allows them to endure with confidence. After 5 or 6 years, the mass of fibrous roots a Daylily produces becomes overgrown producing fewer flowers each season. Dividing these clumps and replanting new divisions rejuvenates the plant. 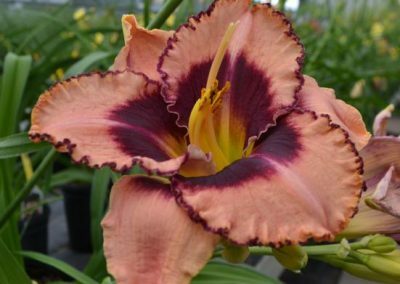 Of course, you do not have to wait the 5 years to divide your Daylilies; dividing once a year is good or once every two years is best. 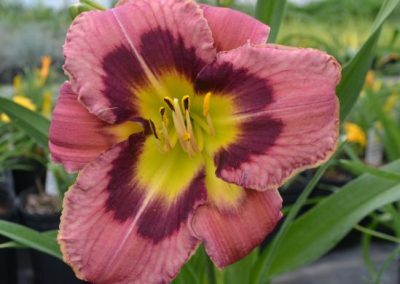 The absolute best time to divide and replant Daylilies is after they have finished blooming, in late summer, early fall or early spring. 1. Prepare a new Daylily bed. Preparing the soil for a new daylily bed before digging the old clump allows you to get the divisions into the ground without delay, before their roots become dried and damaged from exposure to the open air. Remove any weeds from the chosen spot and work the soil to a depth of a foot or so, incorporating several inches of peat moss to make the soil more pliable and moisture-retentive. 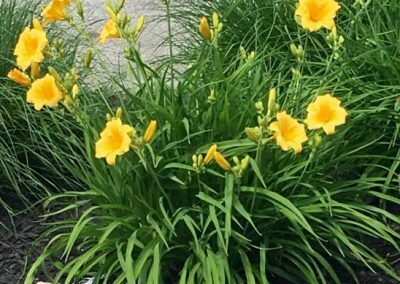 Cut back the Daylily’s long outer leaves to about 6 inches to make it easier to handle. Try not to damage the new inner leaves growing in the center of each fan. With a pitch fork loosen the soil all around the clump. Work around the perimeter several times to free as many of the roots from the soil as possible. 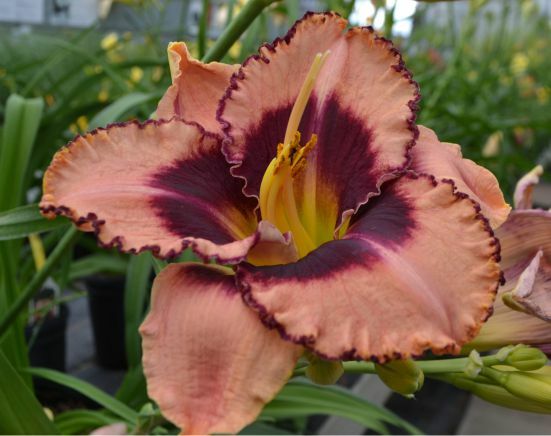 Because daylilies develop extensive root systems, it may be necessary to dig down 10-12 inches. Next, use the fork to pry the entire clump out of the ground. Shake or wash excess soil off the roots so you can see the individual fans. 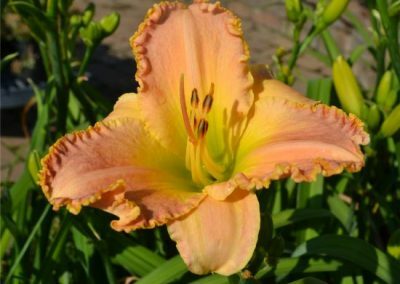 Once out of the ground, a large, solid clump of daylilies can look pretty daunting. Begin by separating it into two sections; use two spading forks placed back to back in the center of the root mass to pry the halves apart. Then pull each section apart or use a sharp knife to cut the clump into smaller and smaller chunks. Dig the planting holes 18 inches to 2 feet apart and wider than the root masses. Then make a small mound of soil in the center of each hole, set the crown of the division on it, and spread the roots evenly around it. If some roots are too long, trim them back to eight inches or so rather than cramming them into the hole. Firm the soil over the roots, covering the crown with no more than an inch of soil. A plant buried under too much soil may rot. Water the plants well and tuck a light mulch in around their bases (but not over the crowns) to help the soil retain moisture. During hot spells, shade the new plants with shingle or shade cloth supported on stakes. When freezing weather approaches, cover them with a mulch of straw or evergreen boughs. The covering protects the young plants from being heaved out of the ground by alternate freezing and thawing of the soil.